Chris Klack of the Penticton Vees uses his speed behind the Merritt Centennials goal to get past Zach Metsa. Final stretch to the playoffs begins tonight, as the Penticton Vees face-off against the Merritt Centennials. After a 12-day break between games, the Penticton Vees are ready to shake off any rust and get down to business. “There is only 23 games left until playoffs and our guys know how critical the next few months are,” said Vees coach Fred Harbinson. That final stretch to the playoffs begins tonight, as the Vees face-off against the Merritt Centennials at the South Okanagan Events Centre at 7 p.m. Nothing like inter-divisional play to get the blood pumping. “We had a great start to the season, we are past the halfway point and we want to send a message to the rest of the teams in our division that we are going to be hard out until to the playoffs,” said Harbinson. Defencemen were clutch for the Vees the last time these two divisional rivals met in November. James Miller and Gabe Bast scored in regulation and Joey Leahy netted the game winner in overtime. Both Miller and Bast will not suit up for tonight’s game as they are sidelined with injuries. After getting a few practices under their skates this week, the Vees are looking for a statement game from their team. “It seems like at home we have played a lot of overtime games and it would be nice to not have such a dramatic finish and get it done in the first 60 minutes,” said Harbinson. The Vees (26-6-0-1) have won all four of the seven meetings played so far against the Centennials (12-14-2-7). Point production this season has come from a number of sources on the Vees. Nicholas Jones leads the team in scoring with 38 points in 35 games. Grant Cruikshank and Chris Klack have also broke the 30-point mark with 34 and 31 points respectively. 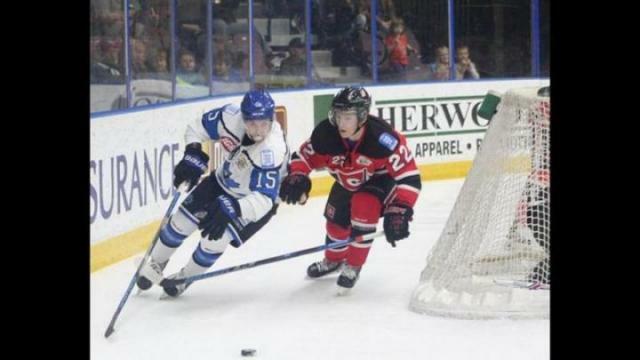 Brendan Harris of the Wenatchee Wild leads the league with 65 points in 35 games.